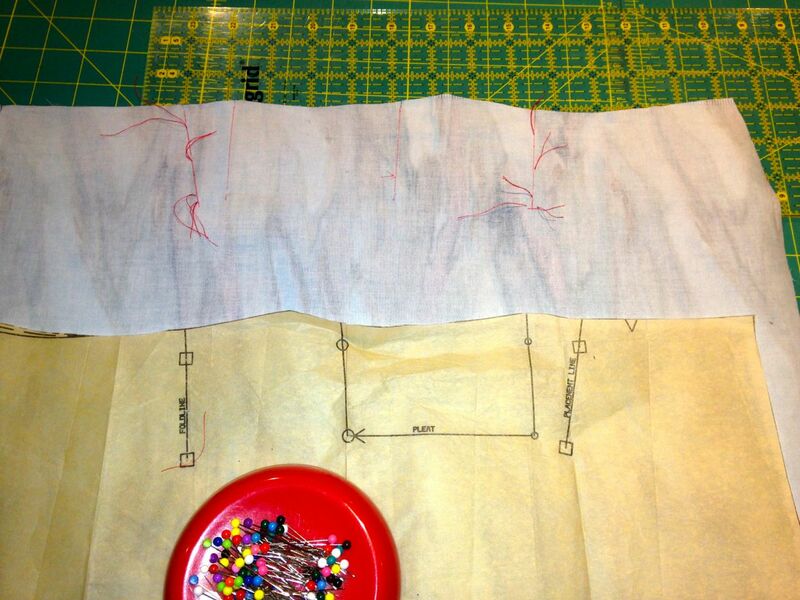 Do you use tailors' tacks or tracing paper? Both? Looking at my tailors' tacks today, I recalled the first time I saw one. My cousin (about 20 years older than me), was sewing a dress for herself. She left mid-project for some reason and I tried to 'help' her while she was away. Between the western and lunar new years, I usually do a bit of decluttering and cleaning. 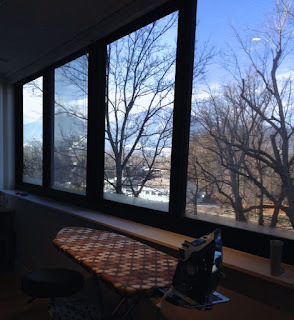 This year, it seems like people have been hit by KonMari fever. I was always a little bit like her, but not quite so extreme. Where others read a how-to manual for discarding things, I read a coming of age story of a young girl, finding her place in the world. The story of her sneaking into her brother's room to declutter it for him reminds me of my misguided attempt to help my cousin. The story of her spending recess in the classroom to rearrange the book shelves broke my heart. What did you get out of The Life-Changing Magic of Tidying Up? 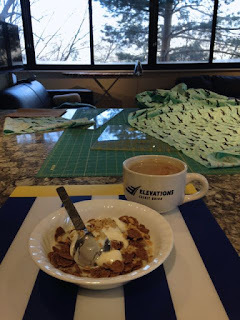 While I was walking, sewing and cooking today, I reflected upon my own stuff diet. Things have not worked out quite how I expected. Both my parents downsized and I took home a carload of sentimental stuff. Somehow, we accreted a second home and filled it. I also know that this is a temporary living arrangement. When DD graduates from high school (only 16 more months! ), we will all live together again. Bad Dad and I have made mental lists of what we will move from LA to Boulder, what we will store, and what we will pitch. On each of my trips to LA, we sort through a different area of the house. The KonMari method sounds cathartic, but is binging and purging ever environmentally sound? Wouldn't it be better to not have over-consumed in the first place? Supposing one has moderately over-consumed, wouldn't it be better to 'use it up' gradually (stuff diet) instead of throwing it all away (purging)? Stuff from my parents' and in-laws' homes and our own excess stuff came in handy when furnishing and equipping our Boulder home. I also frequented thrift and consignment stores in Boulder. When we merge households, duplicate but not sentimental stuff will go back to thrift stores. Meanwhile, I'm dreaming of a time when we will take long foreign family vacations again. When that time comes, these hidden travel pockets will come in handy. Are you the type to "Use it up, wear it out, make it do or do without" or to make a clean sweep of excess stuff? Remember this picture from The Pillow Zoo? In November, Bad Dad helped me mount a television on a column. You can see it in the mirror. The two columns looked like this mid-construction. If you blow it up the picture, you can see the black coaxial cables, blue Cat 6 and white electricity lines snaking through the soffits and columns. 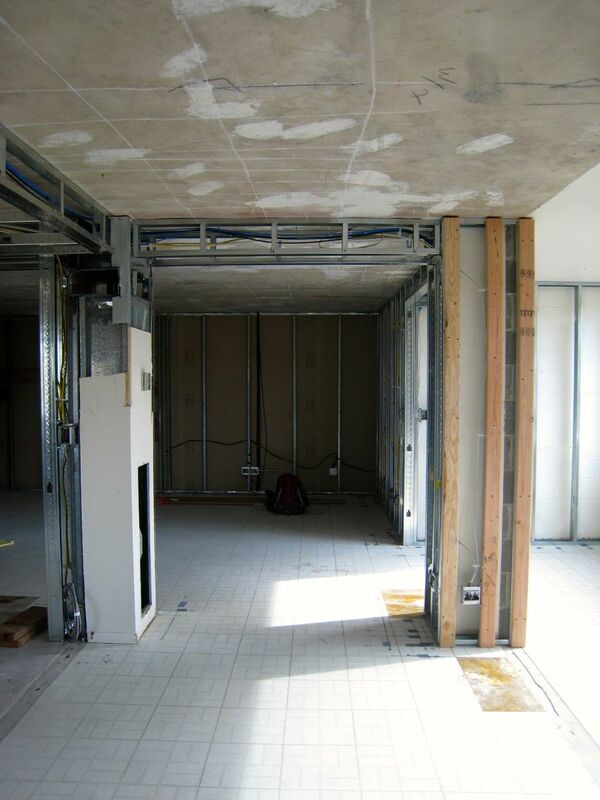 In a concrete building like this, you can't run the electricity through the floors and ceilings. We had to really think through where we wanted infrastructure, and how to route it. My contractor asked me where I wanted to put the TV. I replied that I didn't have one, but might like a wall-mounted one on the column on the right, which contains one of the four support posts in my condo. They built out the R column to match the size of the L column, which contains the HVAC water pipes and fan. They knew that you can't hang TVs off an aluminum studs, so they faced the Al studs with wooden 2x4s. They also put wooden boards between the Al studs in the kitchen soffit, so I can mount pot racks. I didn't have the experience to know these things, but I'm glad that I worked with people who were paying attention to these details during construction. Do you want to see more photos of how we built infrastructure behind the walls? I'm so happy to finally sew up the pair of 2AB pillows. This completes the zoo of 7 pillows I made for the Boulder home. 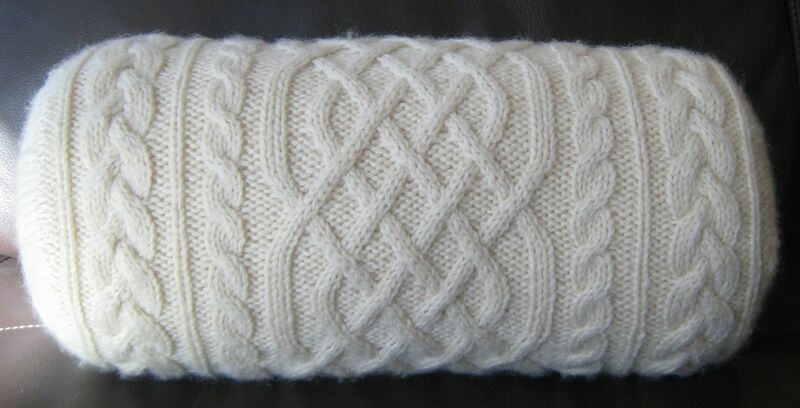 Sometimes, it seemed like a slog, even though I generally enjoy knitting and sewing. 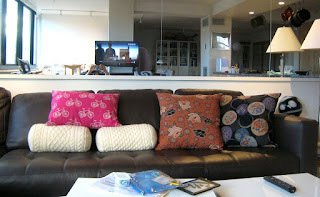 Having the unfinished pillows around my home felt like an obligation and took some of the joy out of my hobbies. 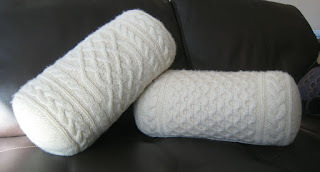 While I had the camera out, I took some daylight pictures of the two knitted bolsters seen earlier in 3 Pillows. Wow, I've had the pumpkin Japanese dobby fabric* and pillow forms since at least November 2014. The bolsters are perfect for softening the rectangular edges of my sofa and sectional. The living room pillow zoo. * I purchased the black dobby fabric here. I got the pumpkin one at Momen+ in Torrance, which doesn't have a website, but ships to customers all over. The fabrics are from the same manufacturer in Japan, but I paid $24/yd in Boulder and $16/yd in Torrance. I've sewn all of the expensive Japanese fabric I picked up at Momen's sale. I already showed the ones sewn up while in LA. I'll show the other completed dobby project later. 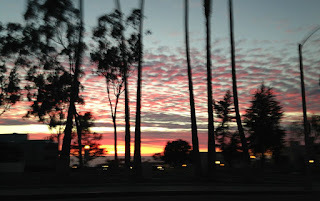 I may have also enabled Leah by introducing her to Momen on our recent walking tour of Torrance. When I started this blog, I was working for a military lab. The security folks took a dim view of splashing the names of their scientists around the web unnecessarily. Now that I am working for an National Science Foundation (NSF) lab, that is not a problem. 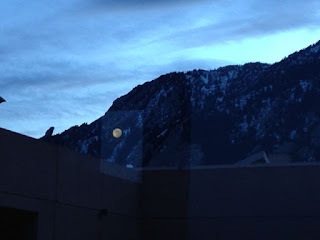 In case you can't get enough of me, I write under my own name at the NCAR Research Data Archive Blog about data and science. I also contribute to LA Observed, where you can find me in the Native Intelligence section. The latter one allows me to repost one of my favorite pictures. This weekend, I sewed a bunch of things that I need around the house besides the visual pun apron. Kathleen Fasanella calls her book, The Entrepreneur’s Guide to Sewn Product Manufacturing, because .sewn. goods includes a great many things that are not garments for humans. If you look around your world, you'll notice how many things are sewn. Garment manufacturing has largely moved overseas, but there are still state-side opportunities for manufacturers of niche sewn goods. Of course, we can be our own manufacturers. 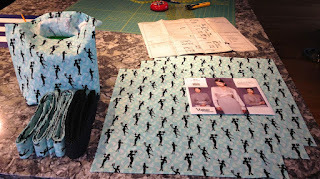 I made two yoga straps, 3 napkins and a lunch bag from the retro aqua fabric. I also refashioned one of Bad Dad's holey T-shirts* into a cover for my heating pad and sewed a curtain to cover the hallway linen closet. 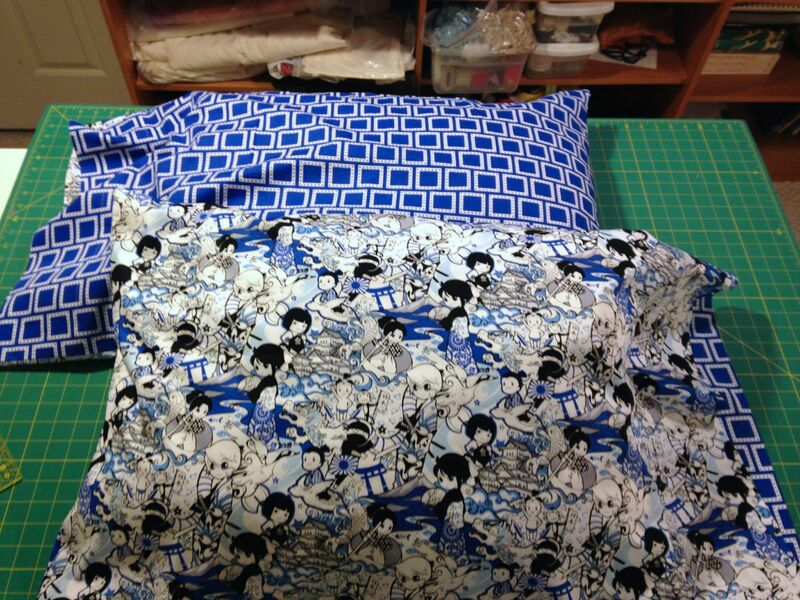 The 2AB pillow covers are on my sewing table and should be finished this weekend. The eagle-eyed may notice the vintage Calvin Klein blouse pattern on the napkins. I'm trying to figure out what to make with my 1.5 yards of 54" wide blue/black Tana Lawn. * The bottom parts of his Ts tend to be fine, while the top develops holes. Why is that? I cut the top parts with holes into rectangular-ish pieces to use instead of paper towels. 100% cotton can be composted. I put my keys and quarters in my apron pocket when I go down the hall to do my laundry at the condo. But, where do I put the keys when I wash the apron? 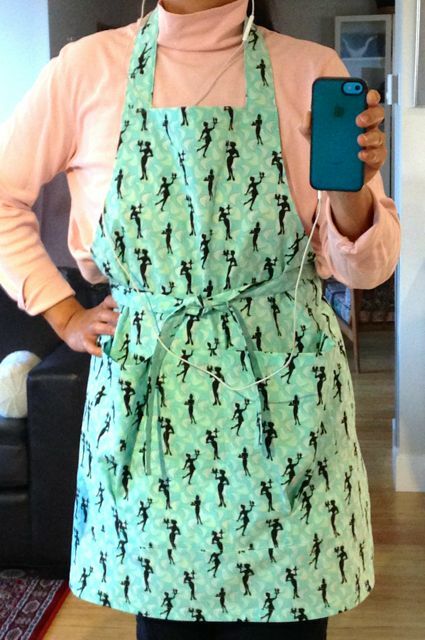 Now that I have two kitchens, I clearly need more aprons. I got a bargain on this retro waitress quilting calico years ago. 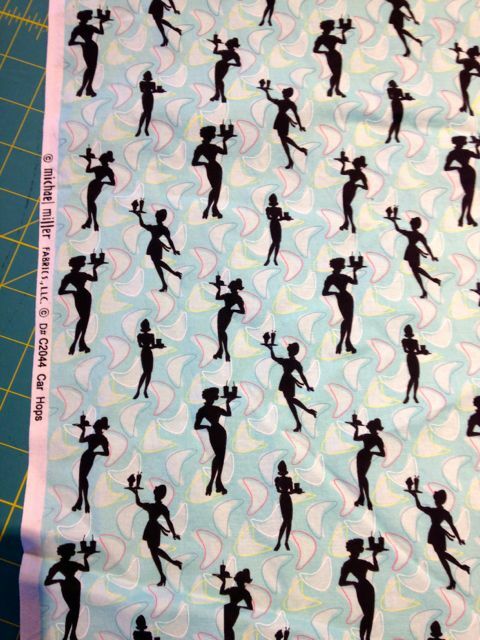 I thought it would be punny to sew an apron using fabric with women with aprons on them. I used my free apron pattern, with a slightly shorter neck strap. I made the center pocket a wee bit bigger, to hold my phone. Have I shown you the view from my ironing board? Or from the sewing machine? Or from the breakfast counter? I've set up my sewing area so I can work efficiently in the condo. But, I'm still fine-tuning where the notions live. If I turn around, I have another cart full of sewing supplies, which hides behind the sofa and TV. The blue rack of clear drawers moved with me from Boulder to LA and back again! I'm astonished that the plastic hasn't cracked yet. Excuse me while I kvell about DD's first (counter)-protest this morning. 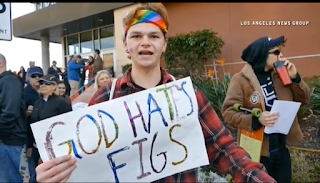 Westboro Baptist Church, the people behind the really offensive URL address, protested the Golden Globes last night. This morning, they decided to spread their message of hate at my daughter's school. They announced their plans on Facebook. Our community was kept busy last week, preparing for the unwelcome attention. The students, with some guidance from the school district's lawyer and the city police department, planned a safe and legal counter-protest. Screenshot from video posted by Daily Breeze. According to CBS LA, WBC was vastly outnumbered by ~300 counter-protesters, including Mike Gin, Redondo Beach's openly gay former mayor. No violence. No arrests. Just a community standing up for its values of inclusion. What did she bring to a WBC counter-protest? Three dozen doughnuts--with rainbow sprinkles, of course! 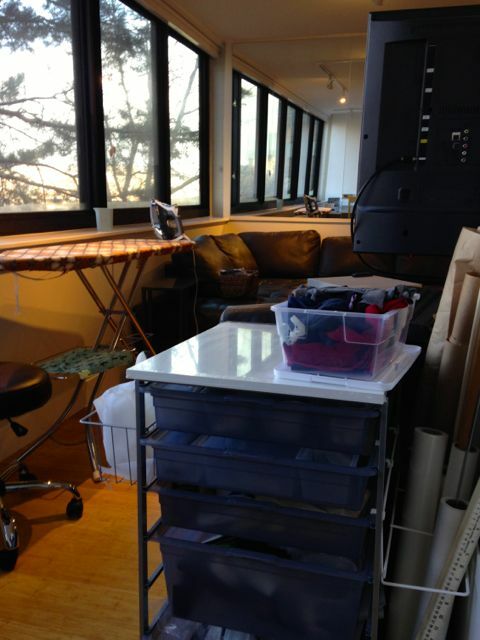 And in the LA sewing room! 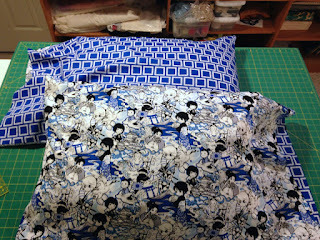 I did a whole lotta clean-up and rethreaded the 25 yo serger before I could make these two pillowcases. 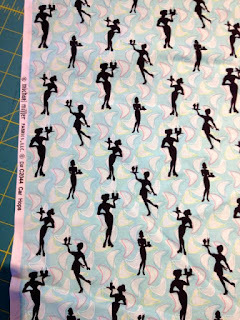 There are a whole lotta shoulds like taking blog pictures in daylight and pre-shrinking fabric. But, life and time is short. 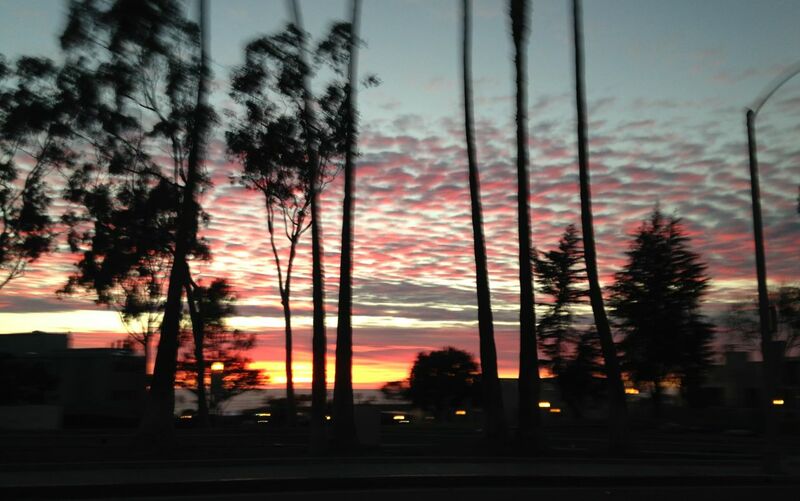 I won't be in LA again during daylight hours for several weeks so this is the only available photo. I didn't have time to prewash the fabric either. 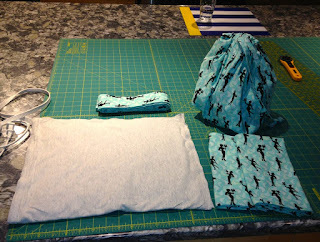 Therefore, the pillowcases are slightly over-sized, but should shrink to fit in the wash. I should also buy her new pillows because these are clearly beaten-down. Regular readers of this blog may have glimpsed DD's blue hair. She selected blue because everyone else has pink or purple hair; she wanted to be different. But, if she had been paying attention to my dye experiments, she would have known that blue and green are the toughest colors to keep on the fiber (her hair). Blue dye came off on her clothes, towels and sheets. Rather than get upset about it, I decided to make her blue pillowcases. 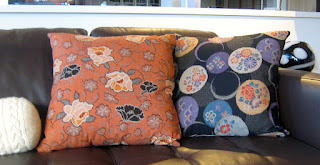 I purchased both fabrics at Momen+ during their annual after-xmas clearance sale. The store opened at 10AM and I got there at 11. 2/3 of the clearance fabrics were already sold out by then. People started lining up at 9:30 AM. DD loves the anime fabric. I knew she would as soon as I saw it on the shelf. I also knew exactly how I was going to use it. We're getting some much-needed rain. 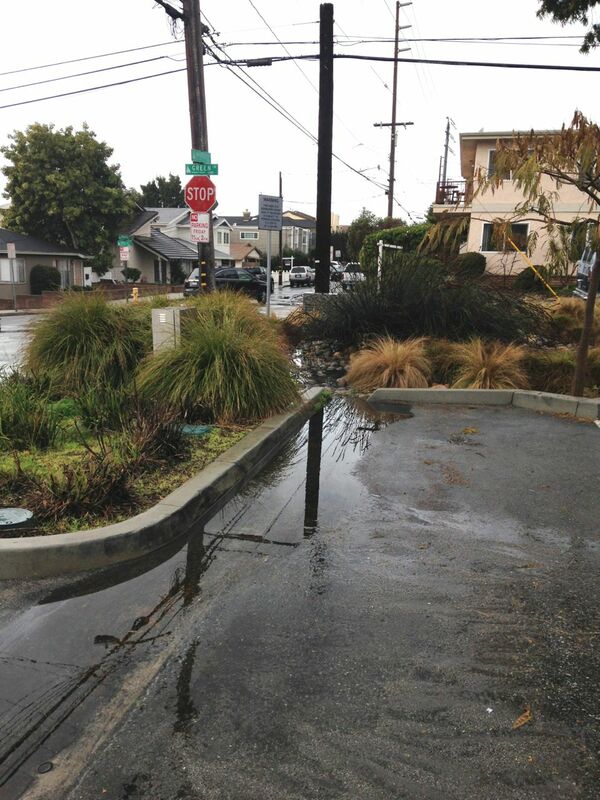 Unfortunately, LA is (mostly) not built to make the most of the rain when it does come. But, let's talk about what engineering for rain looks like. First, read After the rain 1, which I wrote back in November 2010. 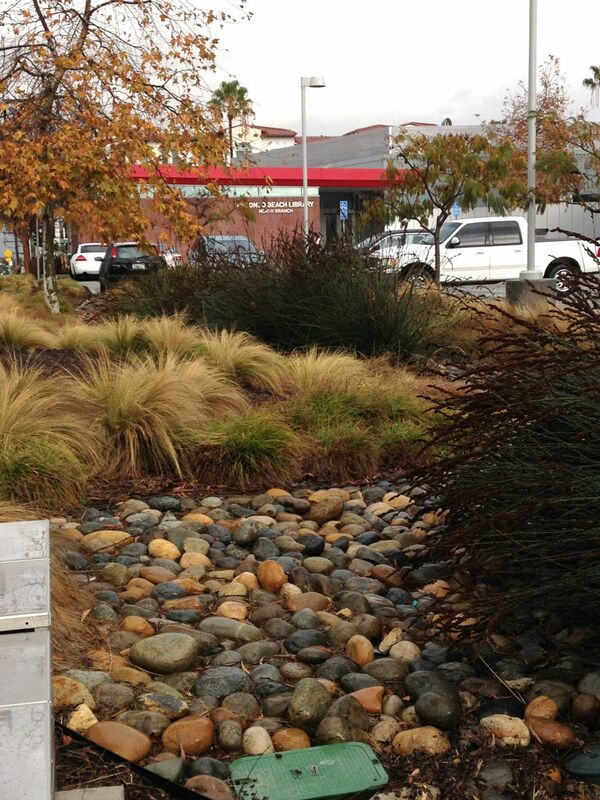 Remember this newly built and planted infiltration basin? This is the way it looked today, after a downpour. There is slight ponding. Some ponding, but less than 12 inches deep. Low point of lot. Slight sheen on water indicates oil pollution. A slight sheen on the standing water shows a light level of pollution. 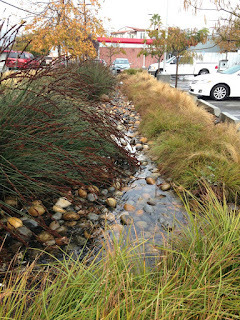 The plants planted in the infiltration basin were selected for their ability to absorb the expected types of pollutants. Plantings have filled in nicely. Because LA depends so much on groundwater pumping, infiltration basins are the most efficient way to bank water for use in dryer times. They take up less surface area, cost less, and look so much nicer than rain barrels. The view from the uphill side shows more room to stow water while it seeps. 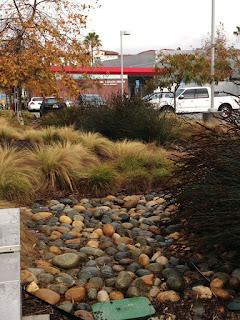 I hired a landscape designer to design a front yard with fruit trees and native flowering plants around the perimeter and a gravel infiltration area suitable for use as an outdoor lounge in the center. But, my neighbor in our HOA objected to pulling out the grass; she says that she bought her house because the front yard looked so nice with the lawn. Her vote counts as much as mine. (Drat!) So, my front yard is still half lawn. 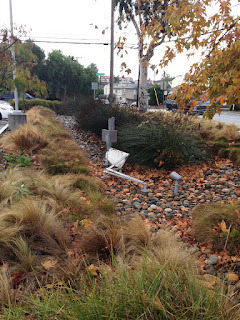 This illustrates that hydrology is as much a social problem as an engineering problem. Heck, I solved the engineering problem. I just can't solve the social problem on my own. 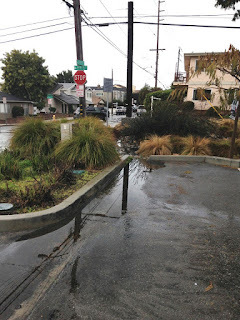 I can console myself with the thought that the west side of my house does drain into a gravel infiltration area and my backyard (south side) also does a reasonable job of rain capture. I place my mending/refashioning/sewing projects in trays, sorted by color and stored in a cabinet of the sewing island. DD's Fall wardrobe, Halloween costume and birthday outfit superseded my other sewing plans in the past 4 months. My cabinet of pending projects overflowed. There was no escape from plowing through the stacks. In one week, my serger sported four colors before I ran out of time. I cut the projects out on Sunday afternoon and rethreaded the serger in the mornings by daylight, before going to work. 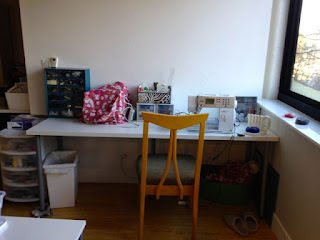 After work and weeknight dinners, I was ready to sew. 10-20-30 minutes to sew in practice! 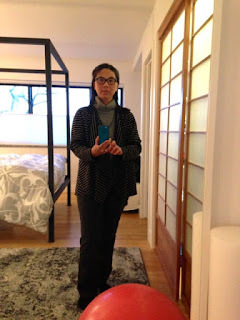 In one super-busy week, I hemmed a 3-pack of ribbed tanks to curve over my hips, cut three bias striped jersey scarves, repaired a fraying bath towel, refashioned two thrifted t-shirts using Kwik Sew 2555, made a pair of PJ pants from Vogue 1146, repaired a thrifted turtleneck and hemmed two RTW pairs of pants. These are not the most glamorous makes, but they are needed makes. I barely touched my 2014 and 2015 sewing goals and lists*. A new job and subsequent inter-state move; home search, renovation and second move; and family work took precedence. 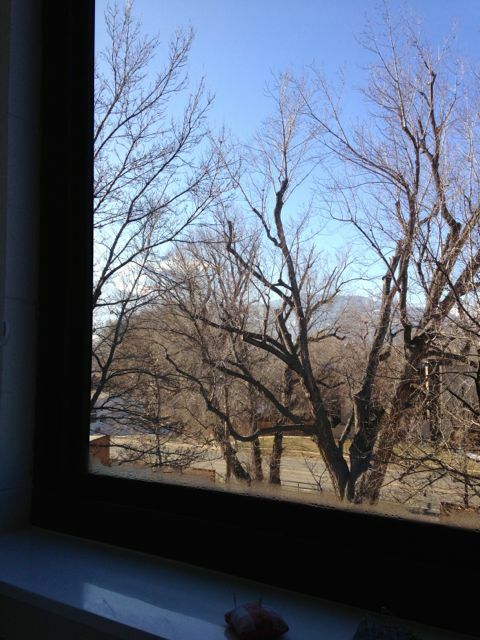 But, it's nice to dream of a future with more spare time, which I can devote to exploring new directions in making. In 2016, I resolve to resume my dyeing experiments. Anyone in Boulder want to participate in a tie-dye party? * The lists will be rejiggered and serve as reminders and motivators instead of sources of guilt. Fabrikated asked, "what won't you sew?" As I got dressed on this particular morning, I thought that this outfit is fairly representative of my active wardrobe. I made the cardigan, thrifted the turtleneck* and bought the pants RTW. In 8th grade home ec, I tackled a pair of fly-front trousers in cotton resembling Osnaburg. I learned to make darts and set in a zipper. My skinny teen self needed only minor pattern adjustments, which my teacher helped me with. The color was awful on me and didn't go with any of my other clothes so I didn't wear them much. Nevertheless, I was pretty fired up and made several more pairs of pants in high school. My FIL expertly took in the back waists of RTW clothing for me. Score! I could buy and wear RTW while spending my sewing time making frosting instead of cake! My FIL is firmly retired. My middle-aged waist to hip ratio is no longer so atypical. 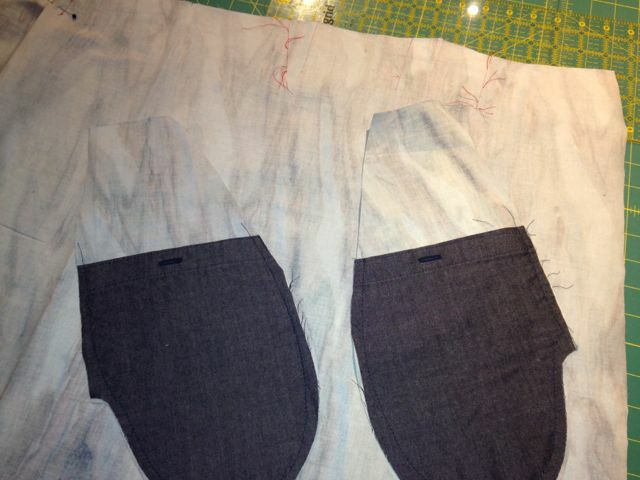 Also, RTW manufacturers have wised up and make several different fits. I can buy perfectly reasonable pants labeled "curvy fit", "contour waist" and "fit 2". Life got crazy-busy and I squeeze time in to sew for relaxation. Sewing fly fronts is not relaxing for me. YMMV. T-shirts, on the other hand, are worth my time. My me-made t-shirts provide me with thicker fabric, better fit and softer fabric and seams. I even shave time by remaking thrifted L/XL t-shirts into my size. I also like to make skirts, dresses and tops. Since I purchased a serger, I sew a lot of knit casual wear. I don't think I have purchased a pair of pajama bottoms in the last 20 years. I did buy a PJ set in my breast-feeding days because I couldn't buy the snap-front PJ top separately. 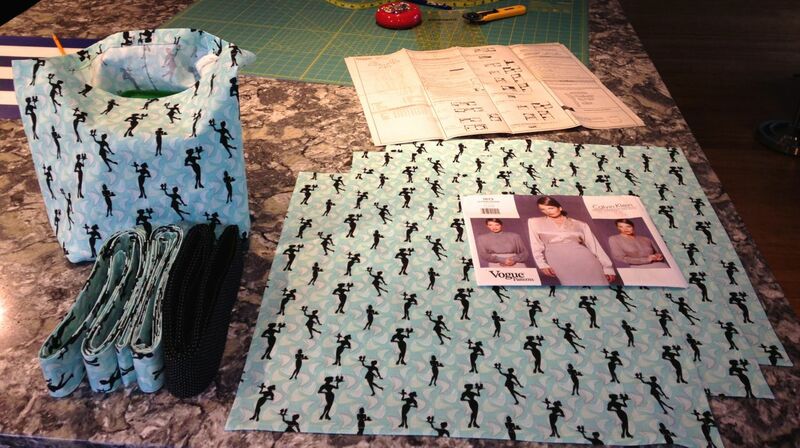 New mother, time-pressed, sleep-deprived = no sewing time. The top is very ratty now (my baby is 15 yo), but the pants are in good enough shape to stay in rotation. * I thrifted the cashmere turtleneck. 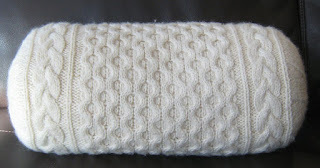 Read why I don't buy new cashmere.